San Francisco is for Plovers: Please vote -- because threatened Western Snow Plovers can't! 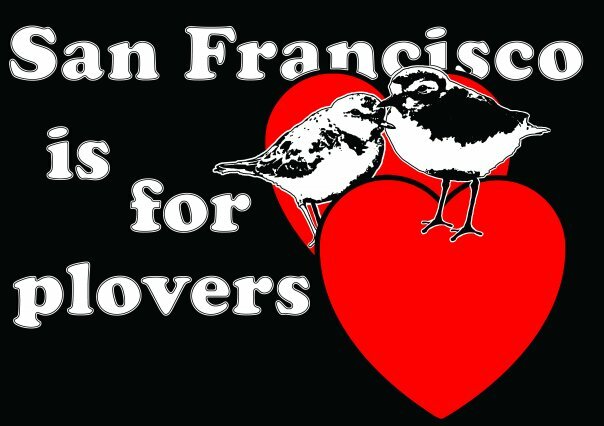 Buy your "San Francisco is for Plovers" t-shirt now! Proceeds to go toward shorebird education. Pennies for Plovers because Plovers Love YOU! Please vote -- because threatened Western Snow Plovers can't! Plovers love voting! Please vote! Every election is an important one for the oceans and species like threatened Western Snowy Plovers. The threats to our oceans only grow if we don't take action. One action that you can take for the oceans is to go out and vote for the candidate that you think will best protect our oceans and other natural resources. On behalf of the oceans -- thanks for voting and participating in our democracy! Pennies for Plovers? Help San Francisco Plovers. We love you!